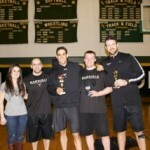 NEW PROVIDENCE, NJ – The New Providence Education Foundation teamed up with Gabriele Fitness & Performance to host March Mayhem last Wednesday evening at New Providence High School. The annual fundraiser features a basketball game played by New Providence teachers and faculty with student coaches and referees. This year, the Gabriele Fitness & Performance crew joined forces with the faculty teams to create one of the most competitive basketball games yet. The NJ ‘Neers team faced the NP Nets team in a game that went down to the wire, with the NJ ‘Neers taking a 51:49 victory. 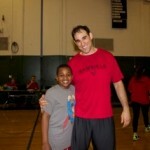 Steven Siracusa of the NJ ‘Neers took home a special MVP award along with four courtside tickets to an upcoming Knicks game. The senior student announcers for the evening, Ben Keller and Kevin Maluso, captivated the crowd with their commentary until the final shot. In addition to the basketball game, March Mayhem offered entertainment and competitions for all ages throughout the event. The New Providence High School Jazz Choir led by Vocal Music Director Susan Kirkland started the evening off with the National Anthem. Senior student coach Jordan Morang led a moment of silence acknowledging the recent loss of Tori Crisafi, a New Providence High School alum and athlete. In between quarters, contests for students of all ages kept the crowd on their feet. The mini free throw contest was open to students from kindergarten through second grade, and the Knockout Contest was open to third- through sixth-graders. The Pioneer Fitness Challenge was a halftime competition designed by Gabriele Fitness & Performance especially for seventh- through 12th-grade students. March Mayhem raises funds for the New Providence Education Foundation, whose mission is to enhance the educational experience of all students in New Providence Public Schools. The NPEF thanked Vince Gabriele and his team from Gabriele Fitness & Performance in Berkeley Heights for co-hosting the event.